The traditional comfortable style reception seating offers simplistic style in a classic range. The three seater sofa has two generously filled seat cushions and back cushions with feathers for extra comfort and style. Shown below with polished chrome feet but also available with wooden feet. 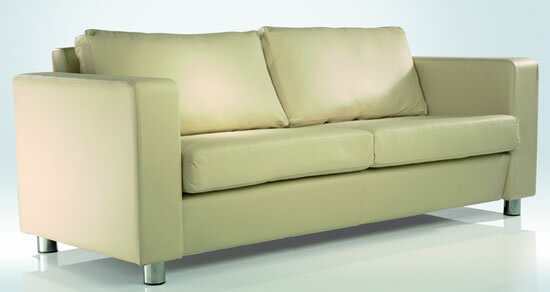 Available as a single, twin or three seater designed to suit any corporate environment. Available in a fabulous choice of fabrics to add style and colour to any interior. The most modern of fabrics and leathers will complete the look and feel of quality. UK Manufactured for great delivery times, quality and price. Made by British craftsmen who mix time proven techniques with the latest technology to produce beautiful results. Sourcing the best raw materials for the skilled team to transform into seating that inspires and endures.